Alternatively it might have been a row of cottages with some facing Cherry Street. But the plan shows no internal divisions. 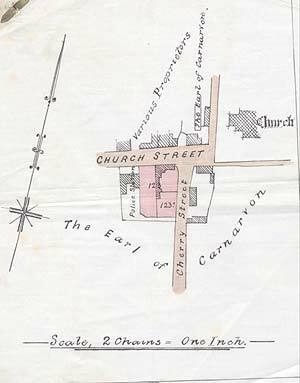 The plan shows the surrounding land mainly in the ownership of Lord Carnarvon, but properties opposite were largely in private hands. Interestingly it seems the Earl still owned number 21 and Seymour Cottage (number 16). He had inherited from his mother, who was the daughter of the 6th Earl of Chesterfield who owned much of Bingham in the 19th century. The estate passed to her on the death of her brother the 7th Earl in 1871. One provision of the lease was that Walker would insure the messuage for £800, indicating a substantial building. Might this have been the original post office and school run by John Strong from 1795 to 1850 rather than Seymour Cottage as local word has it? This house would have been considerably larger than Seymour Cottage and therefore perhaps more appropriate to that use. At the time of the lease it may have been near derelict as Walker clearly intended to build on the plot. 'All that plot of ground...and also those four messuages or dwelling houses erected by the mortgagor (Walker) upon the said ground (certain old buildings formerly thereon having been pulled down)'. So it was a brownfield site! It is interesting to note the mortgage was agreed after the houses had been built, so Walker must have financed their construction by other means. The respective dates of the lease and mortgage suggest a build date of April/May 1987. However we have seen other deeds where an agreement was made to lease for the purpose of building a house, but the actual lease was not signed until the house(s) had been built and the term of the lease backdated to the date of agreement. No such agreement exists for 12 Church Street, but may have done. Thus a build date of between 1895 and 1897 is a safer assumption. On 24th December 1897 Walker assigned the lease to Thomas Hutchinson of Bingham. Henry Hutchinson (a grocer of Bristol) was a party to the agreement. The agreement was for the eastern part of the original plot together with the two houses on it. It provided for a pedestrian right of way across the rear of 12/14 to the rear of the western pair of houses (8/10) and for a fence to be erected between the pairs. The price was £400; £150 directly to Walker and £250 to Halford to pay off half of Walker's mortgage. The ground rent was to be £3-15-0 (half of the rent for the original plot). which is why Henry figures on the indenture for number 14 - to agree fencing etc. There are several Hutchinsons in the directories of the time for Bingham, but no Henry. The veterinary surgeon, Ebenezer had lived in Long Acre (probably Pinchpenny Cottage) until 1881 or thereabouts and a John Hutchinson is recorded as living in Long Acre in 1896; no occupation is given. He is listed, without an address, in Kelly's 1900 and 1904 directories. Thomas Hutchinson is listed for 1900 but not 1904. A Mrs Hutchinson ran a bakers and confectioners in Church Street in 1896 and is still listed in 1900 and 1904. 'Also those two messuages standing in the grounds...in occupation of Mrs Swinscoe and Mr Towers the wall or fence separating the premises hereby demised from the premises on the west belonging to Henry Hutchinson to be party wall or fence and to be maintained or repaired accordingly'. In the 1904 Kelly's directory Jarvis Swinscoe is listed as a coachbuilder, cycle agent and repairer. His premises were in the Market Place about where Thatchers the hairdressers is now. Might it have been his mother living here? A Samuel Towers is listed as a private resident for 1900 and 1904. On 4th October 1905 Fortescue took over the whole of the mortgage . Thomas Hutchinson died 18th June 1907. His executors were Frederick Hutchinson, schoolmaster of Bingham and Mary Evelyn Hutchinson, spinster of Bingham, presumably his children. They did not repay the mortgage until 3rd July 1915. On 22nd June 1920 the Earl of Carnarvon sold the freehold to Frederick Hutchinson, of Church Street, for £93-15s (25 years rent). As noted in other deeds we have seen, the Earl sold a great many freeholds in 1920, we assume to generate funds for his archaeological work in Egypt. An agreement signed prior to the actual indenture is on pre-printed stationery specifically designed for selling Carnarvon owned freeholds in 1920, with spaces for details of individual properties to be entered by hand, suggesting a lot were to be sold! As with other similar sales of freehold the Earl retained the mineral rights. One can presumably assume the freehold to numbers 8 and 10 would have been sold at the same time. The freehold sale indenture shows clearly the right of way. Mary Evelyn is not mentioned in the freehold conveyance although she continued to have an interest as an executor. By a surrender agreement of 24th July 1928 she transferred her interest in the property to Frederick for a consideration of £200. Frederick had already purchased the freehold of course. Their neighbour F A Richmond, of Church View, now 19 Church Street opposite, witnessed the agreement! On 24th July 1952, Frederick Hutchinson, now described as retired schoolmaster, sold number 14 to Elizabeth Ross of Sheffield. The property was described as 'the easternmost of a pair of messuages known as Morgan Villas' - the first mention of this name. The price was £1200. Hutchinson is 'of Church Street', probably number 12. When he wrote his will, in January 1959, Frederick Hutchinson is 'of Morgan Villas' so was clearly living in number 12 at this time. At his death in August of that year his son John was living at 79 Forest Road in Nottingham and is described as company director. On the 22nd December, John Hutchinson sold number 12 for £1450 to David Newton, another teacher. As was common at that time Newton took out a mortgage with Bingham Rural District Council, for £1305. He borrowed further small sums from them for improvements in November 1960 and January 1965. The present owners bought it from him in 1976. Thus the house has been in the ownership of only three families since it was built, although there was a period in the early 1900s where a tenant occupied it.